Curb appeal is a huge factor when it comes to selling your home. The exterior is the first thing potential buyers see when they drive up, and the picture of the exterior is used in majority of the marketing. Everyone knows you only get one chance at a first impression, and we like to make sure we have the best possible one! 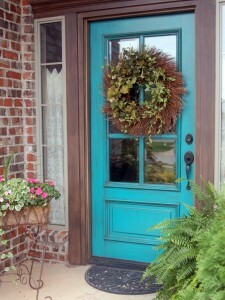 Not only does it start the showing off on the right foot, improving the curb appeal can boost the value of your home. There are a few quick updates you can do that are cost-effective and make a lasting impact in a buyers’ mind. The first idea is updating the front door. Whether you decide to replace it, paint it or freshen up the hardware, this entry point is a great place to “wow” buyers right off the bat. 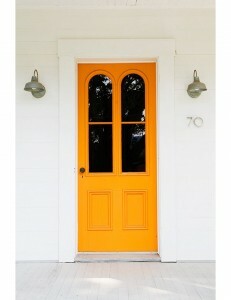 Maybe a bright orange front door isn’t quite your style, but here are some fun color ideas from DIY Network and inspiration for coordinating lights, rugs and planters at One Kings Lane. You can personalize your entryway with a wreath, furniture, flowers or fun outdoor rug that coordinate with your new door color and style!